Following the autumn break comes the ‘inner block’ for YIP, time to let the darkness turn us inwards, to reflect and to explore the hidden corners, the dimly lit corridors of our souls. We encourage this, as in the past YIP has fought against the seasons, which in Sweden are so strong, only to realise that to breath in and out as the sun does can give us much more. I write now in this way as sometimes I’m asked why we talk so much of the days and the sky and the seasons in the newsletter for an educational program. YIP is a social entrepreneurship – we skill up young, enthusiastic people to take action on the matters they see can benefit the world. So then it must be important what work is being done and how, but we also want to see who is doing that matters. This is a fundamental principle to YIP that any who have visited, during the year or for Initiative Forum, will have felt. The environment in which YIP takes place, both physical and social, is a vital contributing factor into the shaping of those young people who attend the program. 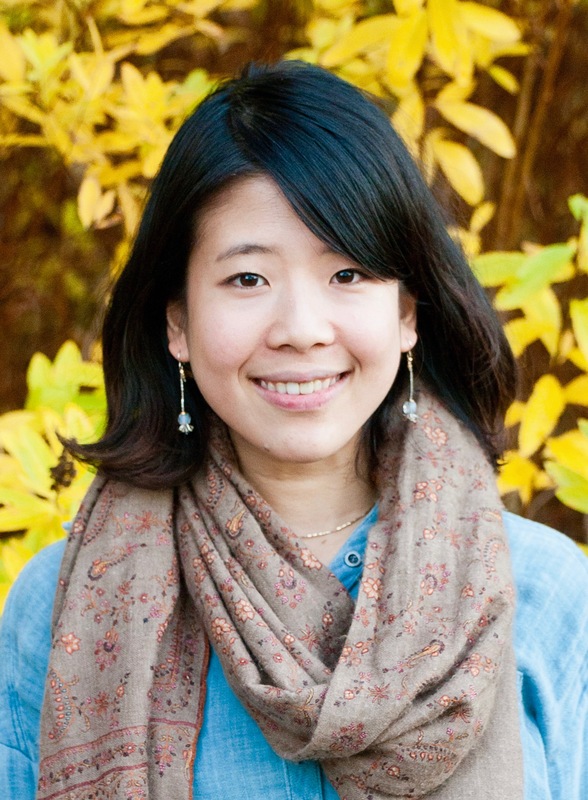 It seems to me then, that to faithfully communicate the happenings of YIP to a wider audience through this newsletter, we must give a window into the ‘who.’ We encourage all participants to express themselves in a way that they see fit, so that you may live a little of what it is to be here each month. As I look again out of the window the sun is gone, the light conditions changed. They are ranging towards darkness now. 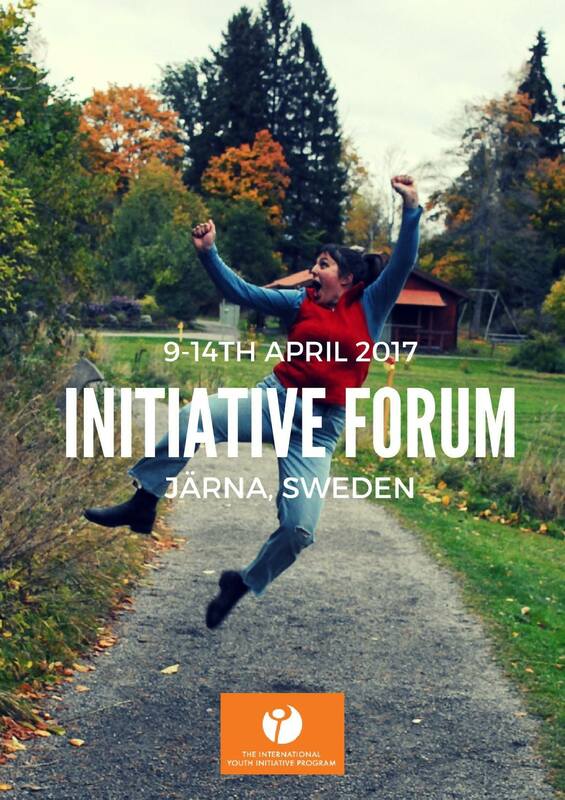 YIP9 would like to invite you to the Initiative Forum 2017! Initiative Forum is an innovative annual event for young adults to connect and engage with each other in the face of global challenges. Running for many years, this international gathering helps empower and ignite personal and social developments in a dynamic week-long conference. Although we haven’t finalised an official title, the theme will be around borders and boundaries, both inner and outer. We will be looking at the positive and negative forms of these thresholds and how they affect the world around us. 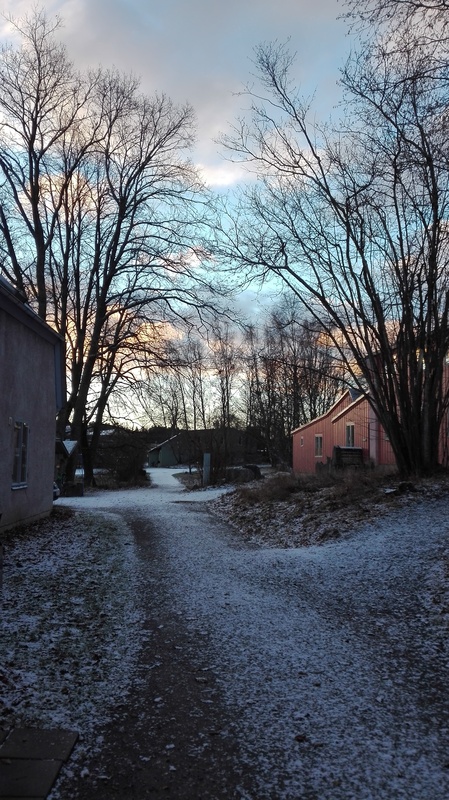 Initiative Forum is set in the beautiful landscape of Ytterjärna, Sweden. The main events will be held in the Kulturhuset and we will also make use of the surrounding campus. 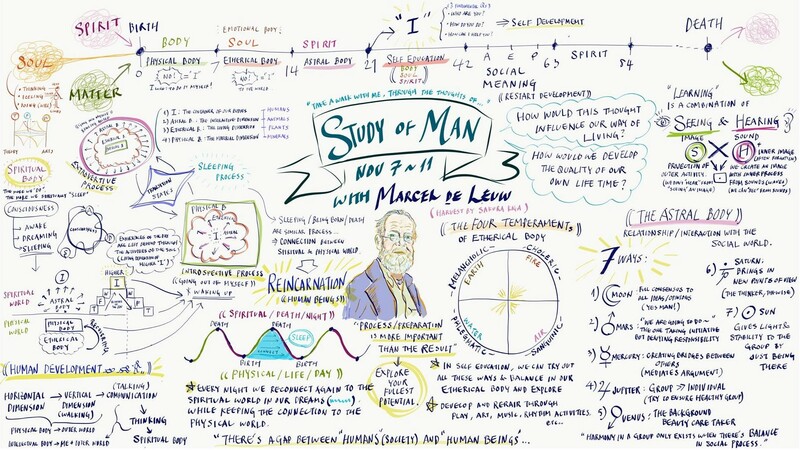 We started this term with Marcel de Leuw taking us on a journey into The Study of Man by Rudolf Steiner. Marcel has studied this book for the last 42 years and has been a Waldorf teacher for many. This is an impressive amount of time to study a single book and his knowledge, wisdom and inspiration as a teacher clearly shows. The Study of Man is one of Steiner’s principle texts on Anthroposophy and is the basis on which Waldorf and Steiner education stems from. Marcel’s own personal experience accompanied his explanations of the texts which helped us to digest the information. We looked at the fundamental understandings of Spiritual Science and how the human being develops between 0-21 years of age. 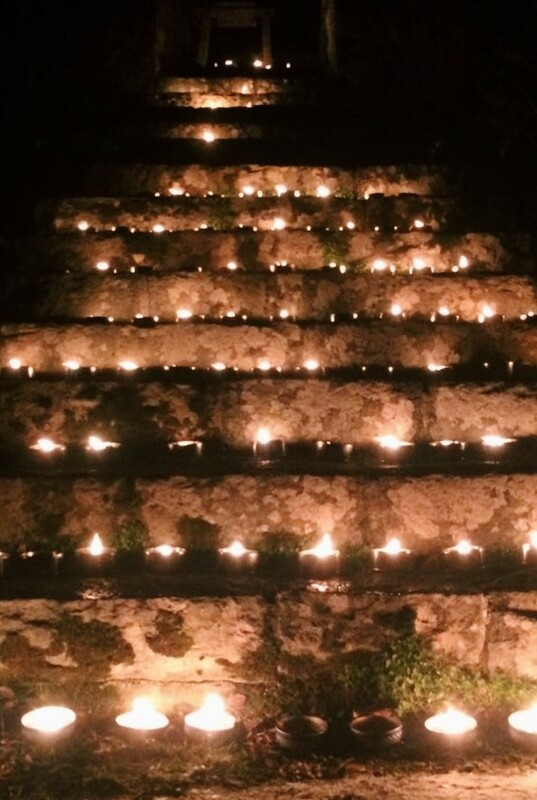 At the start of the week, Marcel asked that we let him guide us through the week, at the end of which we are free to take or leave what is given. For many of us, the information was very new and took an open and inquisitive mind to follow. Everyone dived into the week with questions and a genuine interest in the text, which allowed for our own understanding and merging with our view of the world. It was a great start to the term and a perfect prerequisite to Annie’s Biographical Counselling, which will take us on a journey of development from the age of 21 onwards. It was a unanimous feeling amongst us Yippies that Marcel is a wonderful teacher, who is both easy to listen to and captivating in his stories. He could see easily if our minds were to wander and would use mental exercises both to bring our attention back and to portray the essence of what he is teaching. We all wished we had him as a teacher during our formative years! Our own YIP organiser Annie Meijer took on the role of contributor, showing us a different side to the person we all know and love. She used her talents and passion to create a space for Biographical work, which as a side-note, should be distinguished from Biographical Counselling. Alongside Annie we were joined by Mary Mcarthy, a long-term contributor of YIP who has been hosting the space for yippies since the program started. During the rest of the year, she uses Biographical Counselling with bereavement and loss; a testament to her strength and warmth. The structure of the week took a different shape: a time for education and exercises in the whole group was followed by smaller groups sharing our biographies throughout the day. At the start of the week, we were taken back through our lives from childhood into adolescence, glimpsing and sharing our memories from the age of 0-10. Moving on from this throw-back into the past, we shared important relationships and how these meetings changed the lives of those involved. Then we took a dive into our moments of struggle, to see how crises and times of uncertainty can later be revealed as times of learning and strength. To finish the week, we unravelled those moments on “I AM”, when our decisions made us stand firm in who we are and change the course of our lives. Biography Week was at times challenging, but often revealing and insightful. It was a subjective matter of sharing our memories, struggles and triumphs, but it also showed us the similarities in our human experience and allowed for a bond to grow between us all. Thanks to Annie and Mary! Rachel Miller, a long-term friend of YIP, artist and local yoga teacher, led us through a two-week process of Portrait Painting. Using acrylic colours, we were enabled to face ourselves and our lovely imperfections. It’s amazing what we managed to produce after two weeks, painting for 3 hours a day. Many of us had little to no knowledge or experience of painting, let alone using acrylic paints which dry quickly and provide their own challenge. Rachel liked to point out, however, that acrylics do allow the artist to go from dark to light unlike other paints. For many of us, it was a very personal process to stare into our faces for hours at a time. Some didn’t like the picture they chose to paint and others started over a few times, but we did not get put off! All of us persevered and finished with an astounding piece of art, all of which reflected the likeness of the person painting themselves. We had many ‘feedback rounds’ which allowed us to share our perception of each other and opinions of the work, as well as give helpful tips for painting, during which we had many direct lessons in non-violent communication and saying-what-you-mean. The course would not have been the same without Rachel, who was at the core of the experience. Our learning process, both on and off the canvas, was clearly defined and coloured by Rachel’s own teaching style and personality, which holds nothing back and gets right to the point. I wonder if I learnt more about how to paint, or how to look at myself and how to interact with others. A first in YIP’s history, YIP9 had the pleasure to meet and learn from Marja de Vries, author The Way, who taught us how to see “The Whole Elephant Revealed”. The title of her book is taken from a parable in which three blind men are asked to identify an elephant, each man can only feel a part of the elephant and thinks, for example, that it is a strong pillar (its leg) or a hollow snake (its trunk) but they fail to see the whole of the animal. In this way, Marja showed us how we might only be seeing a portion of reality from our materialistic “stronghold”. She presented seven Universal Laws which apply to everything in existence, how humanity is tipping the balance of order and chaos and what we can do to reverse this trend. She does not claim to have created the Universal Laws, instead she has spent many years researching spiritual teachings, ancient cultures of the past and living wisdom traditions of today. Her intellectual knowledge is balanced by her own experience of ritual, which she brought into the course with her wonderful and engaging storytelling. It’s amazing how much information she managed to convey in just 5 days of morning-courses. The same information would take us many years to discover through our own research, but this does not mean the search is over! There were many, many questions raised by the yippies, and although Marja did a great job to explain her point of view, her ultimate answer is that we are to find our own truths and not believe anyone else’s. It is clear then that all this intellectual knowledge needs balancing in our own experience of the Truth, and this journey will continue for many years to come. As Christmas approaches, most families are writing wish-lists, caroling, and setting up trees. At YIP, of course, we’ve been spending some time making Christmas decorations…but during most of our spare time (which is hard to find), we are working away at our internship preparation as the time before we leave is approaching quickly. For me personally, the internship is the most exciting time of the year. My internship group is spending six weeks in The Netherlands. We are a tight-knit group of six passionate, and motivated young women, with a lot of planning ahead of us before January 7th, when we arrive at the Vrije Hogeschool to begin our internship! During these weeks in The Netherlands, we have been given the opportunity to teach a course to the students of Vrije Hogeschool (an amazing gap-year program similar to YIP, that supports young people as they try to find their path). Creating a full course for the first time in a few short months is a challenge, but such a great learning experience for all of us so far. We have the pleasure of being guided and trusted by some excellent staff and students through Skype calls and documents in order to create an exciting plan for our time in The Netherlands. We are still working out the kinks, but are planning to cover a sample of the things that we care deeply about such as political issues, food production, sustainability, alternative products, inequality around the world and much much more during our course at Vrije Hogeschool. Unlike the other internship groups at YIP, we got the chance to meet some of the people from The Netherlands before our internship. Six lovely and unique students represented Vrije Hogeschool and joined our YIP group for four weeks on their own internship. During this time we were able to discuss the content that they are interested in learning, their preferred methods of education, and just generally get to know them, and their experiences with and expectations for Vrije Hogeschool. I am so grateful to have been able to meet these special people and to have been given a little insight on our internship to The Netherlands before it actually happens. We have a lot of ideas, diversity, and overwhelming amounts of energy within our group, which makes this process very fast-paced, and sometimes a little stressful, but I know it will be worth it at the end of those six weeks. During the break and the last few weeks before we begin, we will keep working hard, and hopefully it will pay off, and our course will be a success! During the past 3 months, the dramatic yet calming first term at YIP, I’ve been experiencing shifts, swirling changes and release, the sense of ice melting within myself. Along with all the courses, in the daily living, through conversations over coffee and meals or bed time talks with my dearest roommate Carla, life at YIP has been bringing out many new viewpoints and questions, and having the time for myself, communication with people, laughters and tears, beautiful nature surroundings and architecture around us, playing music, the little library in our home, all these “spaces” have been an essential part of my personal development. I’ve been exploring the possibilities and potentials in my personal initiative, using all these “spaces” around me here at YIP, to realize one interesting fact about the Japanese concept of “space”. As in the title, the character for “space” is 間 (ma). And the interesting part is that we have two ways to describe human and time, by adding 間. Human is written as 人, and 人間, and time is written as 時, and 時間. In my thought it’s quite similar to how we use “human” and “human being” in a different nuance in English. I have never really thought about this difference in these Japanese words before, but I’m now curious to explore the meaning behind 間 (space) as a theme of my personal project. I’ve also been realizing that not having “space”, or not being aware of “space” has been a major cause of many of my struggles within myself and in any kind of relationships. So as a way of healthcare, which is one of my passions, I’m excited to look into the potential of “space” and see how I can work with it. Also, during the past two weeks we have been working on portrait painting, I fell madly in love with painting and found it very natural for me to work with colors as a way of expression. So I hope to create more space where I can paint in my favorite overalls. 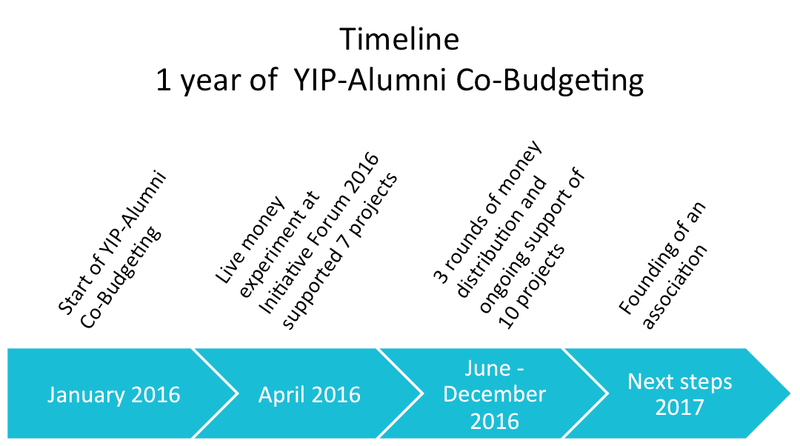 Within the YIP Alumni group there is a strong will and interest to support one another, financially and otherwise. Yet until now, this has been very adhoc processes and has required a lot of energy every time a request for funding is made. This project streamlines this process and creates a continually replenishing pre-existing pool of funding that these requests can be directed to, tracking what is funded and enabling everybody to participate in this process, independent of personal finances. In the picture you can see a timeline of this initiatives activity over the last year. During the Initiative Forum 2016, we conducted a live money experiment and supported 7 projects with 440$. Since June, we distributed money bimonthly on our Co-Budget platform to support 10 more projects with more than 360$. We are happy to bring the project on the next level. The next step is to set up an association. This will be initiated in the coming months. We will keep you posted on the proceedings. 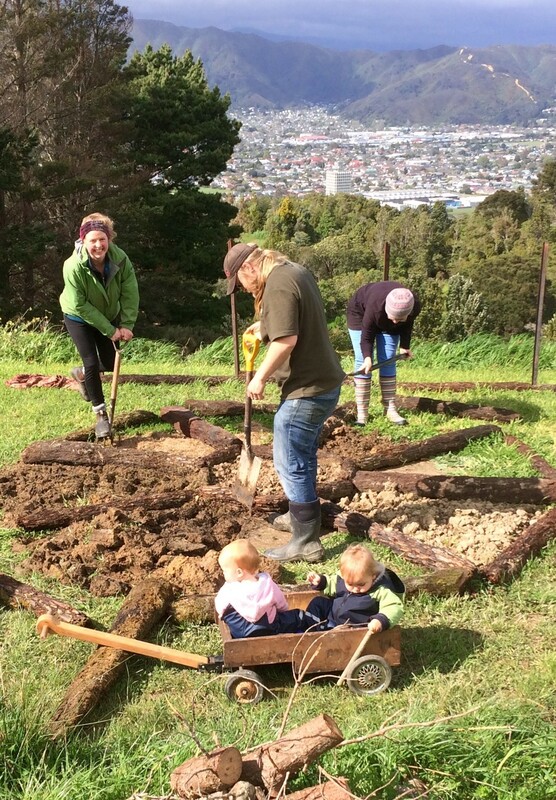 I thought I’d share a wee story of hope (and hard work) from “down under”- the story of Hearth Trust community, a family initiative, sprouting up in home soils! This initiative is about as close to home as it gets! It is being set up by my family and I to create a nourishing home and community for my brother Timothy who has autism. Whilst it has a very clear purpose: to support adults with special needs, we are creating an intergenerational community with rich scope for creative imagination! Early last year a generous philanthropist supported us to purchase several homes on a beautiful piece of land. We have now begun the exciting journey of exploring how we want to live, work and create together on the land – every day shaping both the tangibles and the intangibles! Trees are being planted, gardens sewn and eggs collected! One of the most astounding things has been the endless stream of support we have received. The world (and yippies!) keep knocking at the door! Right now we have Nola (YIP3) contributing her time and skills to support the land development process, which is also going towards her architecture graduation project. We have been having great fun combining Oasis Game methodology with Permaculture Design Principles – ESPECTACULAR! More recently we have had Thomas (YIP4), Mischa, (YIP3) and Lucy (YIP4) in some of the many rooms the homes accommodate, with rumours of more on the way! This all serves as a great reminder for how our little story here weaves into the much bigger story of which you are all a part! As some of you will have observed or come across online, YIP9 has been meeting a new challenge that no other YIP year has had to face so far. It is one of our much cherished qualities in this program, to have as global a representation as possible. Meaning, to have participants from all parts, ethnicities and nationalities of this world. The program and the network have been trying to increase this diversity since its beginnings through initiating various partnerships and the diversity fund to secure and promote this aim. This year however, this striving is seriously challenged by the migration authorities of Sweden. Quite a number of participants, but in particular those that are not a part of the EU agreements and/or nationality need a student visa in order to study at YIP in Sweden. The application for such a visa requires the participants to apply in their home country and to fulfil a standard set of requirements like being accepted at YIP, have enough money or a scholarship, have health insurance and a return ticket. For the last 8 years, ever since the beginning of YIP this has never presented a problem. Sometimes it took a little longer or some details had to be clarified, but (they) all applications where successful. The organising team of YIP has been similarly diverse in the nationalities represented in the team, and also here the visa has not yet been a reason for members of staff not to be able to work for YIP. This year things have been, and are very different and we are largely left guessing why. After waiting for a long time (in the worst case 8 months) the Migration Authorities have denied all students applying for student residence in Sweden their permit. This is a major blow to those students, but also to the YIP9 group and the program as a whole. The decision seems mostly related to the perception and opinion of the agents at Migrationsverket of YIP as a program, rather than of the individual applicants. We are currently supporting the affected students in their process to appeal the decision by Migrationsverket. For 3 people (2 from Haiti, 1 from Thailand) even if the appeal is successful, the decision comes too late for them to attend YIP9. For 6 people who where already in Sweden as tourists, a successful appeal could still allow them to finish the program. Like in past years, those who could enter Sweden as a tourist and stay in Schengen for 90 days, did so and prepared themselves to temporarily leave Sweden once a decision on their study visa was due (applicants should not be in Sweden at the time of that decision) and then returned on their student visa. As the waiting time progressed, so did the 90 days tourist visa. With the tourist allowance running out, we have been saying goodbye’s almost on a weekly basis. All 6 people with tourist visa’s will need to bridge their time until the winter-break and the internships. We hope that over the time of the winter-break, followed by the internships, the legal process will have been concluded before the next semester starts. If the appeals go through, we trust to be secured with regards to student visas for some years to come, but we are also working on a plan B. In plan B, we seek to associate with existing trainings in Sweden and thus to get formal educational status which enjoys a easier visa process. Talks are ongoing towards this end. In the mean time, we would like to give a shout out to all those that stepped up to invite, support and host the students that have had to leave and invite you to keep an eye out on the various Facebook groups for YIP and YIP-alumni to see if your support could be helpful. It’s a great result of 8 years of YIP, to be part of such a generous, switched-on and responsive network of human relations that can act and respond to these challenges. With the ‘inner block’ well under way, YIP looks toward wrapping up 2016. While the cold is beginning to set in, the inner flames are alight and our minds turn to the last few weeks left of this year. Following that comes an entire week with the whole organising team focussed on preparing for internships. The YIP participants have already spent much of their spare time organising and co-ordinating their various projects, but with such a full curriculum they will appreciate the dedicated time so close to the start date – January 7th. The final days before the winter break is the midyear personal initiative presentation week, in which participants have an opportunity to present, share and learn from each other about their initiative ideas, what they have done so far, what needs yet to be done and any challenges they may face. After that is a farewell dinner and a lot of packing, before the yippies say goodbye to Ytterjärna until February. I am walking the path of my journey, to meet a different culture, tradition, stories, rules and a different way of living. When I was in my room preparing to sleep I could hear the sound of the wind. And during the night the weather was really cold and windy. It was like autumn saying goodbye with a revolution. I said good night to my roommate (Jonna) and I woke up with a really nice dream and lots of snow outside. I realised autumn had had a fight with winter. As I was walking to the whitehouse I saw the snow covering everything. I felt the cold on my cheeks, hands and my nose. I joined the circle to sing the morning song. And to say goodbye to some people. It is sad, but it is just life. And I know they will be with us everywhere and at any time. I am trying to write something of my journey from the last weeks, but I am mixing everything up and I am jumping from topic to topic. When I speak or write and my english is broken, but they still understand and correct me, it makes me really happy. Because learning is the key of growing. I want to close my writing to say that your family are the people who you chose to live with. Not the ones you are born to live with.